I was recently asked by a Twitter pal @Incipi if I had a recommended book list for gifted issues. I don’t yet but that could be another good summer professional project. Meanwhile, visit SENG’s website or Hoagie’s Gifted for for some great recommendations. Right now, I’m reading Social-Emotional Curriculum with Gifted & Talented Students by VanTassel-Baska, Cross & Olenchak. I was sitting next to my daughter on the plane back from Washington DC when I came across some questions in the book (pg. 177) that I thought I would ask her. She was in a gifted program from 1st grade through 12th grade (now 23 yrs old and beginning her career). 1)Why am I in the gifted program? 2)What do I hope the program can do for me? 3)What do I hope to achieve in the program? 4)What would I have to do to attain my goals? 5)What are some possible problems I may face in the program? 6)What perceptions do people have of me as a student who is gifted? I have asked my 2nd grade gifted students the first question this past school year. Their answer was the same as Amber’s: “because I took a test.” This answer indicates that the educators and parents haven’t addressed the child’s learning differences in the classroom and it is also the beginning of the elitism issue that gifted programs struggle with. Because of the answer to the first question, the next three questions in the list had no substance or value so we skipped to questions 5 & 6 (which is quite sad). Because adults have ‘picked’ a student to take a test we’ve set up this idea that that one particular student is special somehow. 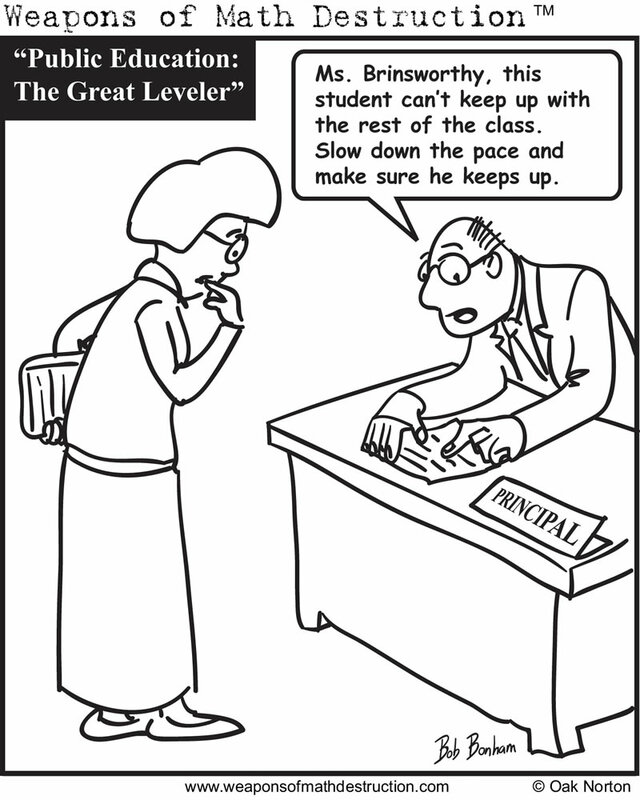 When one is special there are no problems with being in the gifted program, right? This was not the answer I heard from Amber nor the answer I’ve heard from my students or other adults. Issues with bullying, ostracizing, additional work, mislead expectations, identity, etc, all begin to crop up. Let’s not forget the benefits of being in a gifted program: challenging & stimulating work, interesting discussions, academic opportunities, friendships with other like minded individuals, etc. How many parents and educators have you run into who understand that being identified gifted is not ‘all a bed of roses’? Many just know that being in a gifted program is the ultimate thing to do without really researching the program to see how it meets the needs of the child. This is why I truly respect those parents who ask questions about our program! Ask any child who has been in a gifted program or has been identified as gifted and they will tell you just what other people think of them! Phrases like ‘you’re weird’, ‘smarty pants’, ‘you’re gifted, how come you don’t know that?’, ‘that’s easy for you, your gifted’ – they have heard them all. It takes a very mature child to accept those phrases and still be able to focus on the good experiences that being in a gifted program has to offer to them. Bear with me a moment: An article recently swirling around in the #gtchat, #gifted on twitter has drawn attention: “The Pitfalls in Identifying a Gifted Child”. I took the time to read through the 40+ comments and drew this conclusion. If we identify gifted children then we MUST support them. Raisin’ Brains. Additionally, I watched a 6 year old debate with a college professor who was discussing Pascal’s Triangle during a workshop at a gifted conference. Asking him to use manipulatives to understand how to add would be a waste of his time and your time! Most children are not this ‘gifted’ and need less differentiation at home and at school. These are extreme cases to make my point. Teachers and educators: support these children (and their parents) wherever they are academically, understand the purpose of a gifted program, explain the program to all your students if this is necessary. You would do no less for every student in your classroom regardless of their ability! When was the last time you thought about your educational philosophy? Recently, I was asked to prepare my educational philosophy for an application. The last time I wrote down my educational philosophy was during my undergraduate degree program. Since then, I’ve focused on the education of the gifted child and taught five years. Yep, things had changed; my knowledge and experience in the classroom required me to totally ditch what I had written around 1999. What I thought would be a small project became a several hour project. Now, here’s your challenge: When was the last time you thought about your educational philosophy? I am thrilled to be a lifelong learner and this enthusiasm spills over into my classroom. Teachers who work with gifted students have an exciting job! My job as an elementary educator is to learn all I can, make sense of, and organize the information for all types of learners who enter my classroom. This requires me to be an independent thinker which is exactly what I want my students to become. At the same time, I work to challenge my students to stretch those areas where they are weak and to explore new areas. In my mind, the education of the gifted student would not be complete without respecting their differences and striving to answer their questions. My classroom is ridicule-free. Each individual student is respected for who they are and how they think. I was, and still am, a different kind of learner who would have benefitted from this understanding so extending this respect to my students is second nature to me. I believe that standards and benchmarks are only the starting point to learning for the gifted child. I believe that a student who is getting all A’s is not being challenged enough. Failure and success are important to learning: some failure is essential to developing resilience, drive and motivation to be successful, some successes are essential in building confidence and self esteem. I understand that peer pressure has a strong influence on learning, too. Students have often heard me say that they should NEVER hide or ignore who they are and what they know to get someone like them. I encourage the use of differentiation methods such as compacting, layering, menus, simulations and various assessments to move my students past the society-prescribed learning into critical thinking, questioning, community-service, and leadership opportunities where their gifts can benefit the world around them. I remind my students of the quote, “For of those to whom much is given, much is required.” Holy Bible (Luke 12:48) and spoken by JF Kennedy in 1967. I guide my students to know when to listen, when to accept and when to act. I love to provide learning experiences that engage all the learner’s senses. I love to bring the outside world into my classroom with speakers, demonstrations and links to other cultures. I’ve hosted students from France and Germany and personally learned how important it is to share and value our differences and our similarities. Additionally, providing competitive outlets such as chess, academic, and problem-solving competitions are essential to learning. As a lifelong learner, I encourage other adults to keep learning and questioning too. We need to continue learning in this ever-changing world. Recent discoveries, technology and the wide availability of information give us the tools we need to find our answers. In doing so, we are providing an excellent model for our children. My desire is to value, encourage and advocate for those who have been given much academically. It is important for me to attend local seminars as well as webinars available online to expand my knowledge and skills in teaching the gifted child. I also utilize Twitter as a means to follow & share my experiences with other educators worldwide. Meetups such as the one I started in 2009 (which has met twice and I plan to extend over the summer and next school year) are ways that I’m working to bring parents & teachers together to build understanding for these unique learners. With our collective efforts, the gifted learner in every pocket of the world can be encouraged to reach their full potential. There is much work to do! The question came up during a twitter conversation I had with @shareski lately. Which started me thinking about this entry because it is also a question I get frequently in casual conversations with other educators, family and friends. What motivates someone to ask that question? One theory I have is that my friends, family and co-workers are all looking for validation for their innovative or successful thinking from an ‘expert’ on giftedness. Perhaps they are also looking for some explanation of what it means for an individual to be gifted. We’ve all seen the prodigy children who can function many years ahead of their peers. These gifted individuals are very easy to pick out in a crowd: the nine year old who plays in the local symphony, the 5 year old who understands Pascal’s Triangle, etc. Prodigy children make up only 1% of the population, highly and moderately gifted children make up about 10% of the population. How do we know they are ‘gifted? Identifying young gifted children (which is part of my job as an elementary gifted specialist) is difficult and there is no perfect or fool proof way to do this. This explains why every school district, every private school, every state has its own definition and requirements to be identified as gifted. This comes as a surprise to many parents and educators. Let me diverge for a second: Word of caution: if you are a parent of an already identified gifted child who considering a move, be sure to research how this will affect your child’s educational services. If you are a new parent, please please, do your research first before announcing to your child that he/she is gifted. Know that gifted child requires different learning situations. Many parents are under the assumption that gifted means special treatment or elite position. It doesn’t. Many old-timers (parents and educators) in the field of gifted education will tell you it is not an easy road to choose for your child. Back to the question, “Does this make me gifted.” I can’t make a snap judgment on that so don’t ask me. I would need to apply some of the same testing materials, collect a portfolio of your work, chat with those around you for examples of leadership, empathy, creative thinking, logical problem solving, critical thinking (the list goes on). Then, compile and discuss the results with others in the field. You and I both don’t have time to do that. Did you do something you were quite proud of? Do you feel you are unique in some way in some field? Do others look to you for ideas? Did this come from original thinking (nature) or from years of training and understanding in the field (nurturing)? Further, can you be gifted at a specific moment or about a specific thing and not in another? (The answer is “yes” and if you need some real life examples of this let me know.) You just demonstrated some characteristics of giftedness. It really doesn’t matter if you are identified as gifted by someone else or not. It doesn’t matter if you are an inventor that creates something that changes the world or you just did something quite clever. What does matter is that you get the education that fits your need. Why put a 4th grader who is fully capable doing 7th grade math in the same classroom as those learning 4th grade math? A program that builds itself around age-level peers and academic-level peers equally is ideal for our gifted learners. To wrap this entry up, when you are grown, make it a point to use your skills and abilities to better the world around you. Thanks @shareski for the diversion and distraction and the spark to write this.